MP3 Cut è un semplice programma per tagliare i file MP3. In pratica permette di suddividere in singole tracce, intere compilation mp3 oppure tagliare i silenzi troppo lunghi, estrarre spezzoni o ritornelli per poi utilizzarli come suoneria del cellulare ed altro. 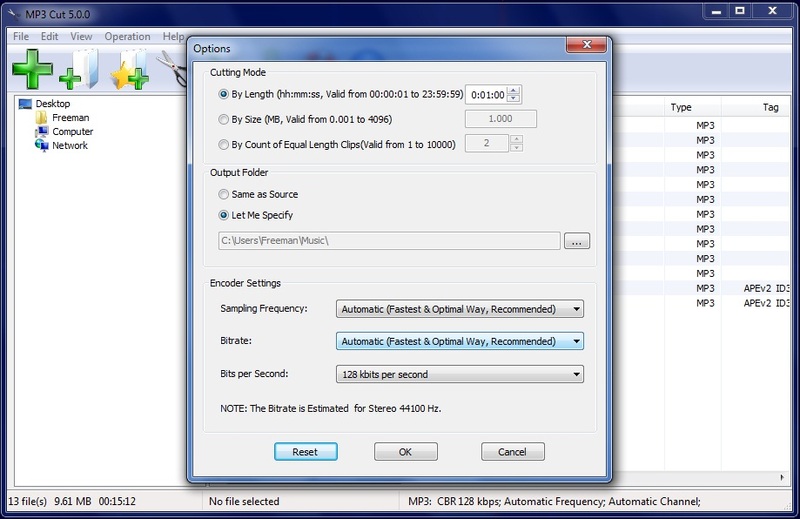 • MP3 Cut is an easy and efficient FREE MP3 Cutter. • Cut MP3 files into specified length clips. • Cut MP3 files into equal-length sections. • Cut MP3 files into specified size parts. • Cut MP3 section whose start and end points are specified by user. • It can copy & save audio tag from the source files to the destination ones, MP3 Cut is capable of writing ID3v1, ID3v2 and APE MP3 tag. • It supports batch mode and can cut hundreds of MP3 files at once. • It is incredibly fast and fully optimized for SSE/Hyper thread technology and you can get extra speed boost if you have multi-core CPU. • MP3 Cut supports on-the-fly converting, in other words, it does not generate temporary files during the conversion process. • It is fairly intuitive to use with its Windows Explorer-Style user interface. • It supports drag & drop. • MP3 Cut can effortlessly search, add and manage the MP3 files to be converted. • It uses the latest Lame MP3 encoder which is generally believed as the the best MP3 encoder.